Dates: Tuesdays, April 2 – May 21. Dates: Fridays, April 5, 12, 19, 26. Dates: Wednesdays, May 8 and May 22. Costs: $90 - Students bring their own tools and purchase clay from the studio. Costs: $35 plus $5 materials fee. Costs: $45 plus $5 materials fee. BEGINNING POTTERY—TIME TO GET WHEEL! In this eight week course we’ll focus on developing fundamental throwing skills on the potter’s wheel. Students will learn how to create a variety of basic forms including basic cylinders, bowls, and lidded jars. Whatever your level you’ll improve your skills, build confidence and have fun along the way. Materials To Bring: Basic pottery tools. Everyone loves a puppy, so come create one (or another favorite animal) out of clay! This course will provide beginning through advance students an opportunity to learn techniques for building freestanding figures using coiling construction and to explore surface enhancements with sculptor, Amy Grabelsky. Bring a photo of your favorite pet – or any animal you wish to create—to use as reference. In this class, geared toward all levels of experience, participants will create a body, add head and legs, and learn to refine the details of your sculpture to create a realistic representation. Participants will learn the skills needed to make a basic plaster press mold. ​ made. Reference the photo to the left. Can be a doll head, buttons, etc. A second class offered soon. Join Ginny Piech Street in the studio for a two-session class in constructing whimsical ceramic garden art for your garden, backyard or terrace. The class will meet in two sessions – the first will focus on design and construction, the second (meeting two weeks later) on glazing and decorative techniques. This 3-session clinic with potter, Maria Sparsis is for those with some prior experience who would like to refine or improve existing skills and learn new hand-building techniques. We will use templates, forms, pinching and coiling to create a variety of projects with a focus on how each potter can incorporate these techniques into their own work. Join teacher, Zoey Bridges, in the studio to create a unique “house” votive holder -- or two or three! Using slab building techniques, participants will create a votive in the shape of a home which holds a tea light. Once illuminated, your creation will look like someone’s home, with the warm light shining through the house’s windows! The creator will design and cut out the windows and shape of the home. Templates will be provided for anyone who wishes. Amazing possibilities and ideas can be achieved through a sound structure. When two edges are securely mended, creativity can easily be applied. The simplicity of scoring, dropping coils, mending, and fortifying walls will be discussed and practiced. The use of basic clay tools and a slab roller will help participants roll out slabs and join their seams. Votives will be bisque- and glaze-fired, after which participants can collect their work from the studio. Join master potter Nancy Blair for a fun-filled and productive one-day workshop. Participants will create numerous simple pottery forms on the wheel and then assemble and decorate them for a tall, showy and impressive candlestick (or whatever tall thingie you want to call it). The only requirement: some experience on the potter’s wheel and a willingness to go big and be silly. Materials To Bring: Basic tools will be provided. Bring your personal favorites. In this 6 week course we’ll focus on developing fundamental throwing skills on the potter’s wheel. Students will learn how to create a variety of basic forms including basic cylinders, bowls, and lidded jars. Whatever your level you’ll improve your skills, build confidence and have fun along the way. Put your green thumb and your clay fingers together to create beautiful and distinctive succulent ceramic planters! Participants will join teacher, Linda Thiessen, to learn how to work with soft clay slabs using procedures that make sturdy “slip and score” joins for stoneware. You will have an opportunity to explore decorative techniques for your unique succulent planters. Work will be bisque- and glaze-fired for you. (Participants return to the studio to collect their work.) No tools or experience necessary. Join Ginny Piech Street in this two session workshop where participants will create their own 12'" to 15" tabletop totems. The totems can be themed or totally abstract. Session one will be designing and building the totems. The second session will be glazing of the individual pieces. Design and hand building techniques will be the focus. WHEEL REFRESHER: COME BACK TO THE WHEEL! Has it been a while? Come in for a two-day, 6-hour refresher workshop with Maria Sparsis to help you get back up and running again. We will review wedging, centering, opening and lifting techniques on the first day. At our second session, we will discuss specialized shapes, compound shapes and trimming. Class size is limited in order to provide individual attention and instruction. 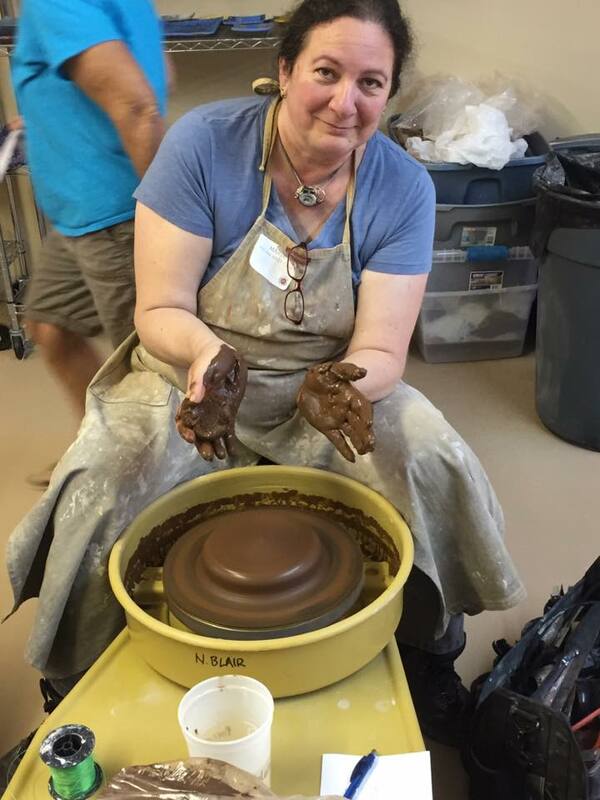 With Ginny Piech Street as instructor, participants will use the pinch pot technique to construct an egg shaped box. They will then sculpt a small bird to sit atop the egg box and act as a stylish handle for the lid. Session one is construction of the bird box. Session two is a glazing session. ​This fun and easy project is the perfect way to dip your hands into clay. Join teacher, Maria Sparsis, for the evening, bring a snack and a beverage if you’d like, and learn how to make fun and functional canape serving trays. Your tray will be bisque- and glaze-fired for you at the studio. (Participants will return to collect their work.) No tools or previous experience necessary. Come in for one evening, bring a snack and a beverage if you’d like, and learn how to make a unique slab-built flower vase with Maria Sparsis. Participants will learn about handling slabs, “slip and scoring” for joining, and explore decorative techniques for their one-of-a-kind vase. Your vase will be bisque- and glaze-fired, after which participants will collect their work from the studio. No tools or previous experience necessary. Learn the basics of hand building in clay. Pinch pot and slab construction will be covered. Course consists of four 3 hour classes. Both sculptural and functional form will be addressed. The first three classes will be making classes. The fourth class will be glazing. No experience necessary. This 3-session clinic with potter, Maria Sparsis, is for intermediate and advanced potters who would like to work on new skills such as: closed forms, thrown and altered forms, lidded vessels, large platters, hollow donut forms, square dishes, composite forms. In this two session class, with Ginny Piech Street as instructor, participants will first make a slab-constructed mug and then embellish it with a face. In the second session, the students will use underglazes to give the mug/face its own personality. ​Spend an evening with Maria Sparsis in the studio, bring a snack and a beverage if you’d like, and learn how to make a trio of nesting serving dishes! These elegant, handled tableware are perfect to give as a gift or use at your next special event. Your dishes will be bisque and glaze-fired for you after which participants collect them from the studio. No tools or prior experience necessary. For cancellations up to one week before the first class day, a refund less $25 handling charge will be given. For cancellations from one week up to 24 hours before the start of class, credit will be given for a future class within 3 months of the class not attended. For cancellations 24 hours before the start of class and on, no refund will be issued. Are you interested in being an instructor? We invite you to submit a proposal for a class of your design. We are now taking class proposals for April, May and June. Following are a few suggestions of classes we may be interested in. But please feel free to be creative with your class offerings. • Beginner and intermediate wheel throwing. Classes can be of varying lengths and times. We encourage you to consider offering day, night or weekend classes. Download the class proposal form, instructor’s agreement and indemnity forms below to submit your ideas. If you have any questions, please feel free to contact the education committee directly at the emails listed above. We look forward to reading your proposals and seeing you at Indian River Clay. Submit proposals to Indian River Clay by mail to Indian River Clay, 1174 South US 1, Vero Beach, FL 32962 or make arrangements to deliver them in person to the Studio. We are not accepting email submissions at present.